In the State of Assam, India there are many places to visit. There are many tourist places. Chandubi Lake is one of them. This lake is located at a distance of 64 kilometers from the city of Guwahati. You can access the lake via National Highway 37. 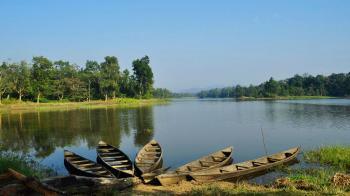 The lake is located at the foot of Garo hills surrounded by Assam and Meghalaya. The place is surrounded by deep forest, tea garden and small and discrete villages. This place is best picnic spot. This lake attracts migratory birds. It is a best tourist place. The place is calm and peaceful. The Lake formed during the Asaam Earthquake in 1897. There is no fees for this place. The Kulsi river surrounded the Chandubi Lake. This place is good for Nature Lovers. Visitors can go for fishing or take boat rides. Chandubi means where the sun sets as "Chan" is Sun and "Dubi" is set in Assamese. The best time to reach in this place is from October to April. In Summer : The temperature in summer is 22 degree Celsius to 35 degree Celsius. In Winter : The temperature in the winter is 10 degree Celsius to 26 degree Celsius. By Air : Lokpriya Gopinath Bordoloi International Airport is the nearest airport. This airport is located in Guwahati. The distance of airport is 20 km from Chandubi Lake. By Rail : Guwahati railway station is the nearest railway station from Chandubi Lake. By Road : Chandubi Lake is well-connected to all major cities.